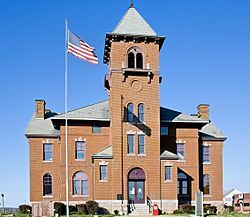 The Fredericktown Courthouse Square Historic District, Fredericktown Missouri Pacific Railroad Depot, Fredericktown United States Post Office, Madison County Courthouse, and St. Louis, Iron Mountain and Southern Railroad Depot are listed on the National Register of Historic Places. The history of Fredericktown revolves around the history of lead mining. The earliest beginnings of Fredericktown occurred around 1715 when local Indians guided French explorers to the area which at that time was part of the Upper Louisiana in order to show them sources of lead which the French had hoped would also contain silver. The French Governor of French Louisiana Sieur Antoine de la Mothe Cadillac, failed to find silver, but succeeded in recruiting other French investors in The Company of the West, organized in 1717, to exploit the mineral resources of Louisiana. The earliest European settlement in the area near what is now Fredericktown was Mine La Motte, a small community about six miles (10 km) to the north. Mine La Motte was first settled by Europeans to mine a large vein of galena lead ore distributed in dolomite that reached the surface there. The need for a local source of lead for ammunition made Mine La Motte one of the earliest European settlements in the interior of the North American continent. Another earlier settlement was the French Catholic community of Saint Michel, Missouri, which is located just north of the current Fredericktown site on the other side of Saline Creek. After the Louisiana Purchase in 1803, the Americanization of the area began in earnest with an influx of second and third generation German Reformed Church settlers from the next county eastward, Bollinger County. Other American settlers were drawn to the area as well, including Moses Austin, founder of the American settlement in Texas, who mined for lead between 1800 and 1820 before going on to Texas. In 1818, the area was organized to form Madison County. The name was chosen to honor James Madison, who had been the two-term President of the United States up until two years earlier (from 1809 to 1817), and who had handled the Louisiana Purchase as Secretary of State for Thomas Jefferson. At the time that Madison County was organized, the land south of Saline Creek was owned by Col. Nathaniel Cook. A new town was laid out on Col. Cook's higher, less flood-prone land, and named Fredericktown in honor of Col. Cook's close friend from Bollinger County, Col. George Frederick Bollinger. The location of Fredericktown at the border of the northeastern edge of the St. Francois Mountains provides a sharp contrast in geography as one travels from east to west. The eastern edge of Madison County consists largely of gentler, more rolling hills ridges of sedimentary dolomite, while the western edges of the county consist of steep-sided, round-profile hills consisting largely of far more ancient Precambrian rhyolites and pink granites. By driving west from Fredericktown on Highway 72 and looking further west, one can witness a rare geological oddity: the fossilization not just of a plant or animal, but of an entire very ancient landscape. As viewed from that vantage point, the round-profile rhyolite and granite hills of the western side of Madison County resemble an archipelago of heavily weathered islands, with the shallow tree-filled valleys taking the place of shallow seas. The resemblance is not a coincidence. These particular hills are fossil islands from the Precambrian period. Even more remarkably, the remnants of the shallow sea in which they once stood can still be seen in the form of sedimentary dolomite deposits that still lap up gently against the sides of the much harder igneous rocks of the hills. The hills were originally islands that developed over a long period of gradual erosion. The islands were subsequently submerged under an ocean, and in time buried under several thousand feet of much softer dolomite deposits. When the Ozark Mountains plateau was later pushed upward again the softer dolomite was weathered away to leave the original Precambrian islands largely intact. Since juniper prefers a more alkaline soil, it is sometimes possible to locate the margins of the ancient sea from a distance by looking for the distinctive light green color of junipers growing on the more alkaline oceanic dolomite deposits between the island hills. Another remnant of the ancient sea can be found in road cuts along Highway 72, where one can find small, rounded granite boulders that once rolled off of the ancient islands and into shallow sea surrounding them. Unlike more familiar forms of granite, these boulders are so soft that it is often possible to peel onion-like layers from them using only one's hands. The softness of these unusual stones reflects the very slow pace of events in the ancient archipelago, since such deep surface-inward weathering requires that the original rounded granite rocks remain immobile and undisturbed over immense lengths of time. According to the United States Census Bureau, the city has a total area of 4.50 square miles (11.65 km2), of which, 4.33 square miles (11.21 km2) is land and 0.17 square miles (0.44 km2) is water. Fredericktown is nearly unique in the United States for the variety of minerals and metals that have been found and commercially mined nearby, including lead, iron, copper, silver, cobalt, nickel, zinc, tungsten, and small amounts of gold, all of which have been mined at various times within 20 miles (32 km) of the town. The mines immediately east of the town, in what has been called the Old Lead Belt, were at one time one of the largest sources of lead in the United States. One of the oldest, and possibly the oldest, lead mines on the North American continent can be found six miles (10 km) north in Mine La Motte. While little iron or no iron has ever been mined in Madison County, very large deposits of mostly hematite with associated magnetite exist 20 miles (32 km) to the west in Iron County. These deposits have been mined since at least Civil War times. Also west of Fredericktown but still within Madison County is the Silver Mines Recreation Area, which is situated along a steep river gorge of the St. Francis River. This area contains the ruins of both a 1920s silver mine and a World War II era tungsten mine. Examples of the minerals that were once mined can still be found in the abundant tailings on the south side of the St. Francis River, just downstream of a now-breached stone dam. They consist of metallic-appearing sulfides such as sphalerite, arsenopyrite, and marcasite embedded in opaque veins of quartz. Careful searchers can also find crystals of wolframite, a tungsten ore that was mined briefly during World War II when access to other sources was cut off, and small grains of topaz, which caused the earlier silver miners of the area considerable economic grief by wearing out their diamond-tipped drills more quickly than anticipated. Both highly magnetic magnetite and slightly magnetic ilmenite (titanium ore) grains can be found in patches of black sands left along the beach of the main swimming area. Madison County also contains unique igneous rocks not found anywhere else, such as Devonite, a colorful decorative stone found only in a single igneous intrusion dike on Mount Devon. Fredericktown is located at (37.559436, -90.294533). According to the United States Census Bureau, the city has a total area of 4.4 square miles (11 km2), of which, 4.3 square miles (11 km2) of it is land and 0.1 square miles (0.26 km2) of it (3.17%) is water. Also found west of Fredericktown but still within Madison County is Black Mountain. Highway E runs along the base of Black Mountain, beside the St. Francis River. While Black Mountain is only the 42nd highest (above sea level) in Missouri, Black Mountain has the largest change in elevation from the base to the summit. The St. Francis River at the base of Black Mountain is about 540 feet above sea level. The summit of Black Mountain is 1,502 feet above sea level, which is a difference of almost 1,000 feet. In contrast, Taum Sauk Mountain, the highest in Missouri, only rises about 700 feet from its base, because it rises from an already elevated plain. Taum Sauk is the highest mountain in Missouri. Black Mountain is the tallest. As of the census of 2010, there were 3,985 people, 1,669 households, and 995 families residing in the city. The population density was 920.3 inhabitants per square mile (355.3/km2). There were 1,902 housing units at an average density of 439.3 per square mile (169.6/km2). The racial makeup of the city was 96.41% White, 0.28% Black or African American, 0.55% Native American, 0.58% Asian, 0.05% Native Hawaiian or Pacific Islander, 1.20% from other races, and 0.93% from two or more races. Hispanic or Latino of any race were 1.83% of the population. There were 1,669 households of which 30.9% had children under the age of 18 living with them, 41.3% were married couples living together, 13.7% had a female householder with no husband present, 4.6% had a male householder with no wife present, and 40.4% were non-families. 36.1% of all households were made up of individuals and 18.4% had someone living alone who was 65 years of age or older. The average household size was 2.31 and the average family size was 2.97. The median age in the city was 38.6 years. 24.4% of residents were under the age of 18; 9.2% were between the ages of 18 and 24; 23.2% were from 25 to 44; 23% were from 45 to 64; and 19.9% were 65 years of age or older. The gender makeup of the city was 46.3% male and 53.7% female. As of the census of 2000, there were 3,928 people, 1,625 households, and 1,010 families residing in the city. The population density was 919.9 people per square mile (355.2/km²). There were 1,817 housing units at an average density of 425.5 per square mile (164.3/km²). The racial makeup of the city was 97.76% White, 0.20% African American, 0.33% Native American, 0.59% Asian, 0.41% from other races, and 0.71% from two or more races. Hispanic or Latino of any race were 0.69% of the population. There were 1,625 households out of which 28.6% had children under the age of 18 living with them, 45.8% were married couples living together, 12.7% had a female householder with no husband present, and 37.8% were non-families. 34.4% of all households were made up of individuals and 21.7% had someone living alone who was 65 years of age or older. The average household size was 2.28 and the average family size was 2.89. In the city the population was spread out with 23.2% under the age of 18, 8.8% from 18 to 24, 24.1% from 25 to 44, 19.4% from 45 to 64, and 24.6% who were 65 years of age or older. The median age was 40 years. For every 100 females there were 78.1 males. For every 100 females age 18 and over, there were 71.7 males. The median income for a household in the city was $21,354, and the median income for a family was $27,149. Males had a median income of $27,593 versus $16,729 for females. The per capita income for the city was $13,512. About 17.4% of families and 22.3% of the population were below the poverty line, including 31.4% of those under age 18 and 14.1% of those age 65 or over. 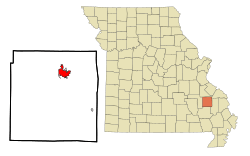 Fredericktown, Missouri Facts for Kids. Kiddle Encyclopedia.